My other half, John, started coming here about a year before I did. We’ve been on this interesting tag team progression of becoming healthier over a fairly long timeline. One of us decides to eat healthier, the other one joins in. One of us joins a gym, the other one finds another activity they love. It was evidently my turn to take a leap. We’ve been married for a fairly long stretch at this point and due to previous work demands, this is the first scheduled thing we’ve ever done together. It’s kind of epic how much fun we’re having with this. So because of John’s experience so far, I sort of thought I knew what I was getting into. When I came in for a couple of free classes, the level of intensity completely humbled me, but I had a strong gut feeling this was something I really wanted to be a part of. The smartest thing I did was just mentally reset myself into blank slate mode and start building from the ground up. I think we develop such weird relationships with our own molecules. These days I I am so much more at home in my body and proud of what it can do right now—even though at a year I still very much consider myself a beginner. And the fact that there’s so much room to grow isn’t discouraging for some reason. It’s actually kind of exciting. And yes, the guys are awesome, but it has been a real epiphany and privilege for me to be working alongside so many strong, smart, versatile women of all shapes and sizes who are pushing their own limits on a daily basis. It’s interesting… last year I decided to stop stepping on the scale because I realized it was a pretty irrelevant number. It’s been a little unnerving, because especially for women, it’s kind of ingrained that we’re supposed to care about that. But really, at a certain point, if you’re eating whole, healthy foods and working your body consistently at CrossFit intensities, what does the scale actually tell you that’s useful? Your body will do what it’s going to do with your treatment of it, build muscle, drop fat, and weigh whatever it’s going to weigh, and you’re just going to keep working regardless of that anyway, right? So I don’t know scale-wise if my body has shifted, but I absolutely know it’s a hell of a lot stronger and faster than it was a year ago. The only numbers I use for determining success these days are my lifts and reps and times—and those are slowly and steadily going in the right directions. Were you active prior to CrossFit? If so what did you do and how do we differ? Falling in love with weightlifting was a brilliant accident. 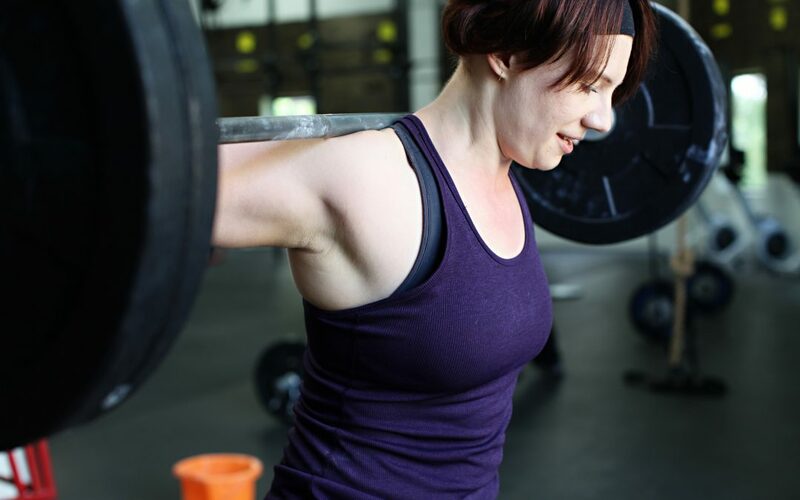 At my previous gym (where I’d intended mostly to swim), I was lucky enough to get sucked into a solid BootCamp class, where I got a lot of encouragement and discovered that I REALLY liked lifting real weights (not just working with machines) and doing multi-skill workouts. As someone who was never really sports-oriented, I was seriously surprised to discover that I am physically capable of doing so much more than I ever thought I was. So I’m seriously thankful for that. I made the switch to CrossFit because I was ready for a new challenge. Some of what I’d been learning already was similar, but the depth, intensity, and diversity of skills are just different. John and I are both so grateful to have found CrossFit White Bear specifically, because it’s a place that’s as equally dedicated to training proper form for complex skills as it is to generating ridiculous amounts of fun. CrossFit White Bear is a second home to us not just because we love the program, but because we love the people. And the workouts, and the extra seminars, and helping with the Open, and volunteering for FreezeFest, and plotting for the costume parties (please, please give me an excuse to wear black makeup again). You get the idea. What has been the most challenging part of CrossFit? Patience. You can experience success on your very first day at the gym, but I think we all want to get stronger so much faster than our bodies can get there. We’ve gotten so used to being able to press a button and have things magically appear. There’s no “Overnight Shipping for only $29.95” option for learning to do pull-ups. It takes time and work and a level of commitment that requires some serious dedication. My progress is not always linear, and sometimes I’ve had to ditch my ego and take two steps back to relearn something properly that will help me go even further in the long run. The progress can seem slow at times, but that time and effort are exactly what make it so rewarding when you fall on your face exhausted at the end of the wod—and see that you bested your last time. It may sound weird, but when I started CrossFit, I intentionally decided to not play favorites. The natural instinct is to like the stuff we’re naturally good at and hate/fear the stuff we aren’t. But I think making those connections adds mental junk that gets in the way. Saying “I hate this” seems like a pretty unhelpful approach toward something you’re trying to get better at. That said, I do think it’s really nice that the wooden boxes have stopped biting my shins—we seem to have finally come to an understanding on that. And there’s something so addictive about the Olympic lifts. Are you sure that chalk is really all chalk? What has been the most humbling moment in CrossFit? And the most gratifying? My most humbling moments were in the first few days where I started to understand the large range of skills there are to learn, and where I was in the learning curve. Like that sinking feeling when I realized pull-ups were going to be a long time coming (and they still are) when I initially needed help to even hold myself up at the bar. But I keep working, and I can see myself getting closer. I am amazed when I look back and realize how much I’ve learned even in just one year. The calluses on my hands are a testament to everything awesome they can do these days and I am just so completely proud of them. Holding on through multiple toes-to-bar. 53# kettlebell swings. Respectably heavy deadlifts. Can’t wait to see what the next year holds. Maybe even pull-ups? Regardless, I’ll just keep showing up. I think the CrossFit program is solid for building strong, healthy human beings—but while every gym can fairly easily program the strong and healthy part, I especially love the way we build human beings at CrossFit White Bear. Because on top of being crazy strong and dedicated, these are people who have a deep desire for everyone to do well, can hurt with people when they struggle, cheer with them when they succeed (regardless of whether or not they can do the same thing), and not let themselves get too attached to comparison or success or failure. And have a hell of a lot of fun together. I’d say that’s pretty epic.